Download 1.5 Gb core content library packed full of beautifully recorded instrument patches and loop ready REX files. 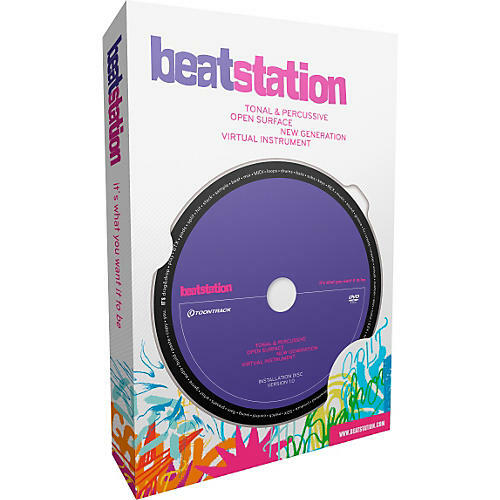 Offering drum, bass and lead instrument creation & arrangement with drag and drop simplicity, Beatstation is your "go to" instrument for quickly getting a full groove up and running in no time at all. As if that's not enough, Toontrack also added full MIDI & REX file support. Couple those features with the flexibility of working in Beatstation as a stand alone instrument or an AU, RTAS or VST plugin inside your favorite DAW and Beatstation becomes a creative musical force to be reckoned with. With the core content, you are granted instant access to all the acoustic, electronic and resampled instrument samples vital to modern production. Each category contains a variety of kit presets with corresponding MIDI variations comprised of drum, bass and lead parts. Keep in mind that they are all just a click and drag away. When using an SDX or EZX you will get a fixed mix of the microphones available for an instrument, typically without ambience. You will also get access to any MIDI included in the SDX or EZX. Beatstation and Toontrack are registered trademarks of Toontrack Music. All other product names used in this webpage are trademarks of their respective owners, which are in no way associated or affiliated with Toontrack Music. Why wait for a box. Order the Download today.